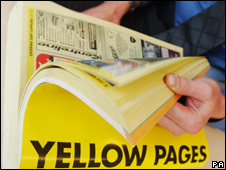 Shares in Yell Group, the publisher of the Yellow Pages in the UK, have fallen more than 14% after it said it had started to restructure its £4.2bn debt. Yell plans to extend the maturity and change the terms of its debt facilities but analysts expressed concerns given current trading conditions. The group has been hit by a slump in advertising spending. It expects a 30% fall in earnings in the next quarter. Yell shares ended down 14.6%, or 4.5 pence, at 26.25 pence. Last month, Yell said it was writing down £1.3bn-worth of assets in Spain and Latin America. Analysts at Nomura questioned the terms Yell would be able to achieve for refinancing its debt - most of which is due in April 2011 - in worsening economic conditions. "We believe any refinancing in absence of a stabilisation in trading would be on very onerous terms," the brokerage said in a note.